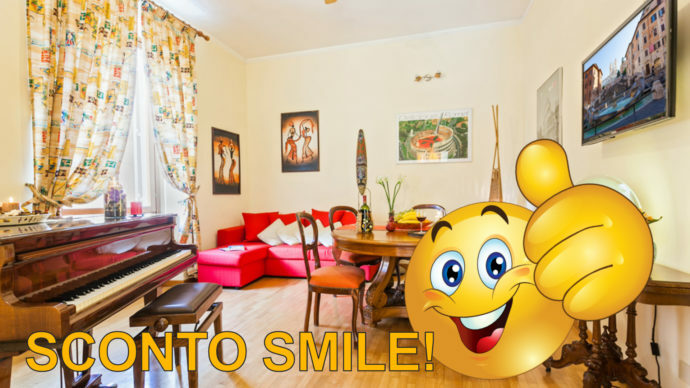 SMILE discount, for the most loyal guests 5% discount on upcoming stays, smile with Prati B & B !! Prati B & B, with its delightful rooms a few steps from the dome of St. Peter wants its guests to feel right at home: Professional and economic, the B & B for 18 years offers double and single rooms for travelers, tourists and couples, straight and gay, wishing to spend a wonderful stay in Rome. For you a double room with private bathroom, in romantic blue and a single with a French bed and bathroom in the room, in the nice yellow color. The rooms are equipped with Wi-Fi, air conditioning, heating and TV, a quiet and equipped place for your unforgettable stay in the heart of Rome, a few meters from the Ottaviano S. Pietro metro, buses, shops and monuments. The landlady Alessandra is always at your disposal for useful advice and to offer you a map of the city. More than 15000 guests have spent some of their lives in the rooms of Prati B & B and for the most affectionate customers our bed and breakfast at the Vatican wanted to create the SMAIL discount, which rewards future stays with a 5% discount, moreover who will have stayed over 6 days, as a present a night, offered by Alessandra to the pleasant guests of Prati B & B. Write directly to info@pratibb.it or on the instagram to the name: pratibbeapt, or call +39 3332192372, tel and wzp, which responds to the blonde owner Alessandra, who will be happy to make use of this special discount for the entire 2019.